The Standard Horizon VAC-600 Deep-pile Collator has five inches of bin capacity allowing for less frequent reloading of paper and long-run production efficiency and productivity. 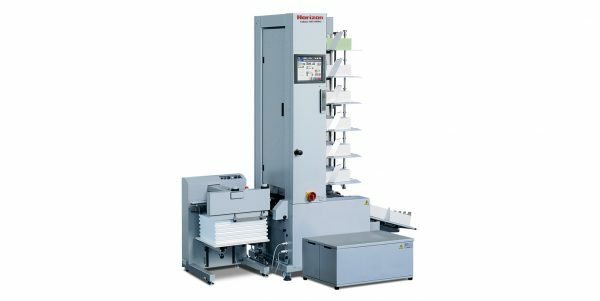 The VAC-600 uses the same patented rotary-pulse vacuum feeding system as the proven VAC-1000, and delivers exceptional speed and productivity on nearly all paper stocks. Up to six VAC-600 towers can be combined to create 6, 12, 18, 24, 30 or 36-station systems in a minimum of floor space. The deep-pile VAC-600 is equipped with a touch-screen control console for ease of operation, advanced programming, error detection and system monitoring. System functions are presented using an icon-based graphical interface.